It is well established that Africa’s mortgage markets (outside some very few exceptions) are underdeveloped, with mortgage to GDP rates well below 5% and the bulk of finance available being targeted at only the highest income earners. This has had a significant impact on the progress of housing delivery, the performance of property markets, and ultimately, the structure of African economies. Of course, the development of mortgage markets is influenced by a myriad of factors, not limited to direct policy instruction. Understanding the parameters that frame this development is a critical area of inquiry for CAHF. 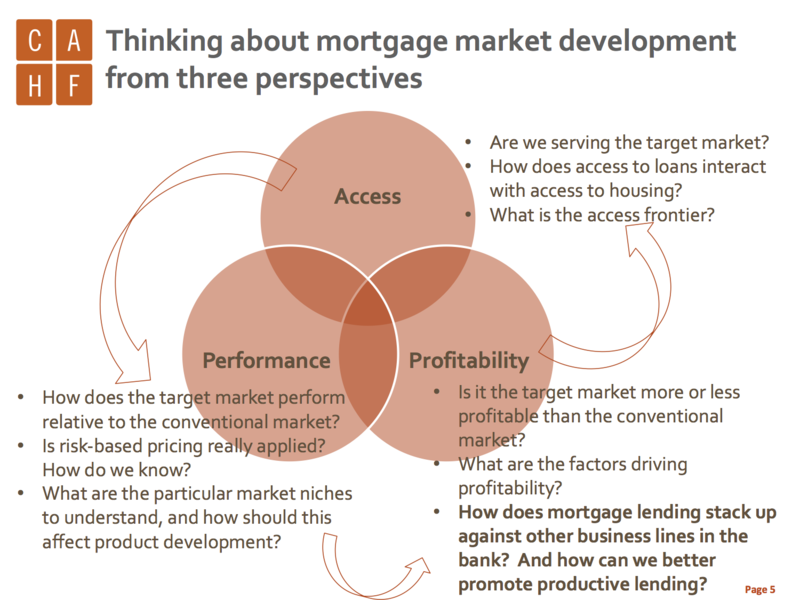 Over the course of more than ten years, CAHF has explored the progress of South Africa’s mortgage market from three angles: mortgage access, performance and profitability. This South African case is particularly useful in that the analysis was undertaken during the course of the Financial Sector Charter, which sought to transform the financial sector in that country, and broaden access to financial services to include those previously excluded. The case offers useful lessons for Africa’s other mortgage markets which, although much smaller, are also seeking to broaden the scope of mortgage lending to achieve the twin objectives of improved housing markets and better structured financial sectors. The tools developed to understand the progress of South Africa’s mortgage market are well suited to consider mortgage markets in other countries. Lenders and policy makers can do much to support such analysis, through the collection and sharing of detailed, record level data. As has been the case in South Africa, this work can then support better product and policy targeting, maximizing the impact of the considerable effort currently underway to grow and strengthen mortgage markets in Africa.